African leaders are attending the state funeral in Addis Ababa of Ethiopia's long-serving Prime Minister Meles Zenawi, who died last month. 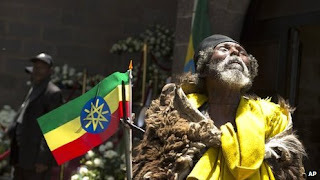 Foreign dignitaries joined ordinary Ethiopians in paying their respects as his body lay in state in the National Palace. Mr Meles died at the age of 57 in Brussels, following a long illness. He came to power in 1991 and was credited for bringing development and growth to Ethiopia. But critics say this was achieved at the cost of respect for human rights. The state funeral - Ethiopia's first in more than 80 years - is beginning in Meskel Square in Addis Ababa, from where Mr Meles' flag-draped coffin will be taken for burial at the city's Holy Trinity Cathedral. The prime minister was a former Marxist rebel and not publicly religious, but was brought up as an Ethiopian Orthodox Christian, the BBC's Humphrey Hawksley reports. In contrast to the secrecy traditionally surrounding the deaths of Ethiopian leaders, the ceremony is being broadcast live, and huge screens have been erected in cities and villages around the country. The last Ethiopian leader to be honoured with a state funeral was the Empress Zauditu in 1930. At least 20 African presidents are attending the funeral, as well as several prominent international figures including Microsoft chairman Bill Gates. One of them, Tanzanian President Jakaya Kikwete laid a wreath next to Mr Meles' coffin on Saturday. He paid tribute to Mr Meles' "charm, his intellect, his passion for Africa's development", adding that he was "a kind of leader that you can trust". Rwandan President Paul Kagame honoured Mr Meles as "a gallant fighter for freedom not only for Ethiopia and Ethiopian people, but also Africa". Also attending is Sudan's President, Omar al-Bashir, who has been indicted by the International Criminal Court on several counts of war crimes, crimes against humanity and genocide in the Darfur conflict. Mr Meles became a dominant figure in the region after toppling toppling dictator Mengistu Hailemariam 21 years ago. He ordered Ethiopian troops to intervene against al-Qaeda-linked militants in Somalia, mediated in the conflict in Sudan and South Sudan, and took a leading position in the African Union, which is headquartered in Addis Ababa. Mr Meles will be succeeded by his deputy, Hailemariam Desalegn, 47, a relatively little-known politician from the south of Ethiopia. Mr Hailemariam will formally take over as prime minister after Mr Meles' funeral, and will serve until elections in 2015. Some observers have voiced fears about the political transition. The Brussels-based think tank, the Crisis Group, has warned that Mr Hailemariam will lead a weaker government that will face mounting grievances along ethnic and religious lines. Mr Meles died suddenly from an infection on 20 August while being treated in hospital in Brussels. He had not been seen in public for weeks before his death was announced, and there had been increasingly intense speculation about his health.